Nicole DeBloois moved to Park City from Minnesota in 2007. It wasn’t her idea. Her boyfriend, Todd, talked her into it. Six years later, she admits, "It’s worked out very well." An avid downhill skier and runner, she fell in love with the town right away. "The trails, the fresh air, the fantastic skiing: What’s not to love?" she grins. The 32-year-old food scientist says the move came in stages. "After kicking the idea around for a couple of years, Todd finally convinced me. He grew up in Utah, had family here, and really wanted to get back to the mountains. We started looking for jobs and I was fortunate enough to find one here. The first time I saw Park City was when I came here to interview. I moved out first and he joined me soon after." DeBloois spent her early years in northern Illinois. Her fondest childhood memories are of visiting her extended family in Minnesota. "My great-grandma Monica would babysit us while the adults went out to dinner. When she would fall asleep in her recliner, my sisters and cousins would get into some innocent mischief, sneaking treats or watching scary movies that gave us nightmares. I was the youngest and sometimes got left out. I think Grandma felt bad about this, so she would keep me company and tell me wonderful stories about growing up on a farm in Iowa with her 12 brothers and sisters." DeBloois moved with her family to Rochester, Minn., when she was 15. "At the time it was difficult for me because I was halfway through high school, but it turned out to be a very good thing for my education," she says. DeBloois went on to study computer science at nearby University of Wisconsin-La Crosse. A chronic illness in her second year of college led to a midcourse career correction. "In 2000 I had tonsillitis that wouldn’t go away and spent the better part of nine months sick and on antibiotics. I finally had my tonsils removed and, while recovering, I watched a ton of the Food Network," she recounts. "There was a chef named Sara Moulton who did a show called ‘Cooking Live.’ Watching her inspired me to want to be a chef. I wanted to finish college first, so I transferred to the University of Wisconsin-Stout and earned my degree in food technology." "As it turns out, chefdom, wasn’t for me," she continues without elaboration. "I still wanted to use my degree so, in 2003, I took a job as a product developer at General Mills in Minneapolis. I worked on recipes for the Old El Paso brand for three years before transferring to the Sensory Department, where I was a ‘panel facilitator.’ Basically, my job was to ensure that our food products consistently met our ‘gold standard’ and to train others to do so as well." DeBloois met Todd while working at General Mills. "He worked on Betty Crocker side dishes. We all worked in a big open lab and his bench was next to mine. It took a year for some of our co-workers to figure out we were dating," she chuckles. They’ve been together for nine years and were married soon after moving to Park City. DeBloois now works as a food scientist for JMH International, a local food producer specializing in soup bases, drink mixes and seasoning blends. JMH is headquartered in Park City, with manufacturing facilities in Salt Lake City. 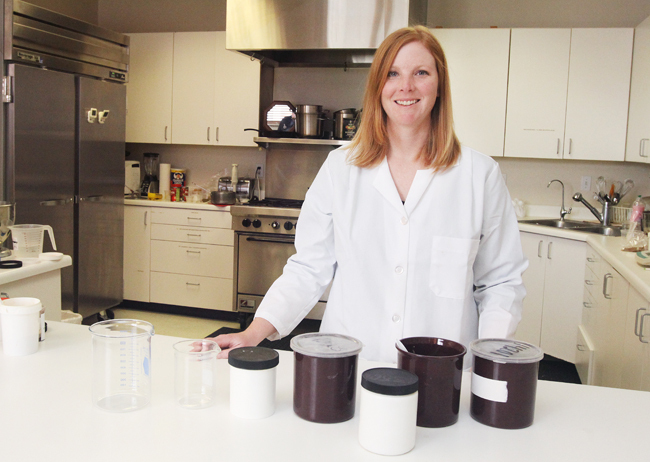 "My job is to formulate products to meet customer needs and to ensure they ‘scale up’ properly when manufactured. I use percentage formulas to guarantee the manufactured products turn out the same as what I produce in my lab," she says. DeBloois has been an avid runner since her early 20s. She credits her bout with chronic tonsillitis for that as well. "I was in bad health for months and decided to start walking and running to get back in shape," she says. It wasn’t easy. "I’d run a few feet, get tired and go back to walking. But I kept at it and pretty soon I was running farther. I ran my first half-marathon in 2006 and then the Twin-Cities Marathon a few months later." Since moving here, she’s taken to the expansive Park City-area ski slopes and trail system like a duck to water. "I’m passionate about trail running,’ she says. "It really requires focus. All your troubles disappear while you’re out there. I also love running in places you can’t get to in a car. Most of all I get a great sense of accomplishment from running long." DeBloois has completed the Mountain Trails "Triple Trail Challenge" a few times and this summer plans to run both the Park City Half-Marathon and Jupiter Peak Steeplechase before tackling the St. George Marathon in early September. DeBloois and her husband are excited about their new home in Hidden Cove, near Jeremy Ranch. "We’ve been looking in that area for a couple of years, but I never thought we’d be able to buy there. The timing was just right." She’s looking forward to working on her new house next spring and summer. "It may interfere a little with my trail-running, but I don’t mind." Favorite things to do: Trail running, downhill skiing, free summer concerts, Park City Film Series. Favorite foods: All Asian foods. "A big bowl of pho is the perfect meal." Favorite performers: Spider John Koerner. Favorite reading/authors: "Yes, Chef," Chef Marcus Samuelsson’s autobiography; "Gone Girl" by Gillian Flynn; novels with good character development. Bucket list: Run the Grand Canyon rim to rim to rim (44 miles). Animal companions: Stella, a four-year-old chocolate Lab. "She is our constant companion and would love nothing more than to play Frisbee all day."